Sakura at Meguro River (目黒川のさくら) is one of the most popular Sakura spot in Tokyo. There are about 830 Sakura on the riverside. From the Ikejiriohashi to Meguro which is about 3.2km becomes Sakura Promenade. 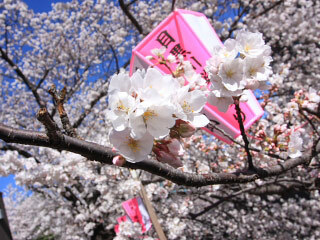 Because it is great location for People live in Tokyo and Yokohama, it is a great Hanami spot. There are many food stand and light up at night. Nearest stations are, Ikejiriohashi, Nakameguro and Meguro of Tokyu Line. Megurogawa has about 830 Sakura, Cherry Blossom at the riverside. At night, there is a light-up and many people enjoy night Sakura as well. During the season, many food stands open for Hanami party.